SacredWiki: a community maintained wiki that also hosts the community patch. Russian copies use StarForce 5 DRM and its online activation. The Gold Edition is a complete edition containing the base game and the Ice and Blood add-on needed for the community patch. A community patch is available to anyone who has the add-on installed. Be sure to run Sacred2Updater.exe after installing it so that you get the latest version. FOV only needs to be edited if playing in Ultra Widescreen. The Collectors Edition came with a third disc with Elite textures adding an extra option to the graphics menu for them. Deep Silver are happy for people to download these textures but cannot supply them as the original developer went bankrupt. Post from Deep Silver community manager. Master, Music, Sound Effects and Speech all have separate levels. Speaker modes: 2.0, 4.0, 5.1, 6.1, 7.1, 8.1. Mission text displayed in dialog boxes. Official servers have been shut down; see Online play. Tungle is recommended although other services will work. Download and install Tungle. Tungle Download. Run Sacred 2 and select Multiplayer (CM Multiplayer if using the Community Patch). Create or select a game and enter lobby. If the host has the Community Patch installed you must also have the Community Patch to join. The lobby will inform you if they do. The Steam version Sacred 2 Gold will crash if launched when the beta client of Steam is installed. Go to settings in the Steam client and opt out of the Beta for the Steam client. Restart Steam and let it download any client updates required. 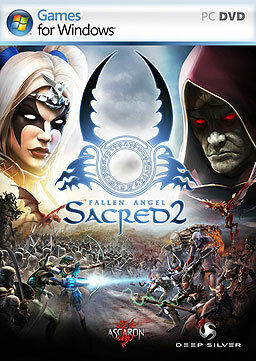 Under Windows 7 Sacred 2: Fallen Angel (Release-Version 2.0.2. or if fully patched 2.4.3.) will crash constantly. Under Windows 7 the Add-on Sacred 2: Ice&Blood (Release-Version 2.64.0.0) will crash constantly. There is no official Windows 7 Fix-Patch for Sacred 2: Fallen Angel. Here is a post on the Steam forum outlining potential steps to getting Sacred 2 to work on Windows 7. However, the only reliable solution is to buy the Add-on. (pertaining to v2.43 DRM-free German) Game will work only if Windows Aero is turned off. Go to the official patch site: Update Sacred 2. Choose the right language for your version. Download and install patch 2.65.1.0. The DRM-free version of Sacred 2: Gold installs pre-patched to 2.65.1.0. The elite textures if installed take up an additional 9 GB of hard drive space. ↑ 1.0 1.1 File/folder structure within this directory reflects the path(s) listed for Windows and/or Steam game data (use Wine regedit to access Windows registry paths). Games with Steam Cloud support may store data in ~/.steam/steam/userdata/<user-id>/225640/ in addition to or instead of this directory. The app ID (225640) may differ in some cases. Treat backslashes as forward slashes. See the glossary page for details. This page was last edited on 16 April 2019, at 01:51.